Samson Racioppi, an Army veteran and former libertarian candidate for U.S. Congress from Massachusetts, was allegedly struck on the back of his neck by a member of Antifa with a bike lock following a protest in front of the Rhode Island State House on Saturday. Alexander Carrion was arrested by Providence police for the violent attack. After officers ordered individuals at the demonstration were ordered to disperse, Racioppi, escorting two older women for their safety, went to the Providence Place Mall parking garage where his vehicle was located. There, he was approached by a group of masked Antifa members. One he recognized from earlier in the day. According to police logs, Alexander Carrion, 34 of Providence, was arrested on the scene for “assault with intent to commit a felony — serious injury, and disorderly conduct. This is not the first time Carrion has been arrested at rallies in Rhode Island. In 2016, he was arrested while demonstrating against then candidate President Donald J. Trump at rally in Warwick. Video showed him spitting in the face of a 19-year-old man. A similar incident occurred in 2017 at a Berkeley rally, where a man was struck with a U-Bike Lock. College professor and alleged Antifa member, Eric Clanton, was charged by police for the Berkeley assault after his identity was pieced together on Internet forums. He may face up to 11 years in prison for the assault. 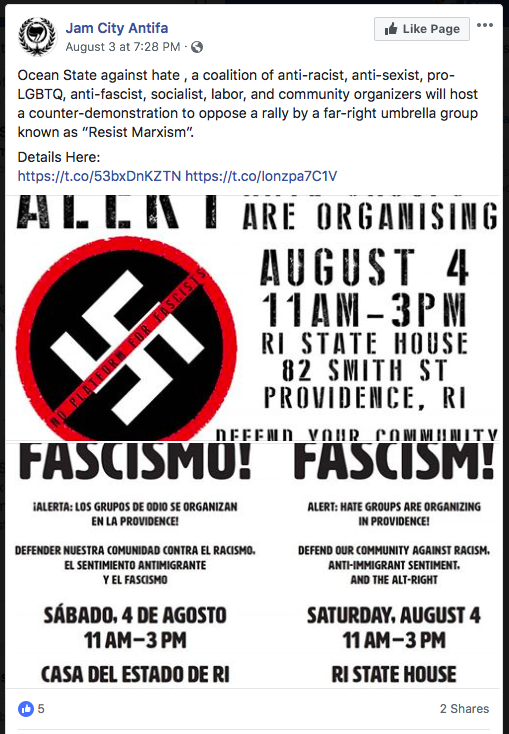 Saturday’s Providence protest was organized by “Ocean State Against Hate,” a progressive and Antifa group in response to a rally organized by “Resist Marxism.” According to published reports and social media posts, approximately 250 Antifa and progressive protesters far outnumbered the smaller group of “Resist Marxism” at the demonstrations. “Ocean State Against Hate” is working with a partner organization to collect funds to post bail for two progressive Antifa members arrested for violence at their protest. Cori Farrow is the point person for their fundraising campaign. She is asking for money to be deposited directly into her PayPal account. A new 17 second video has emerged showing the actual attack on Racioppi. It contains graphic content and language. One day we will have the government in place where men like this are fed to pigs. I hope not! The answer to the Left’s neo-barbarism is revived civilization. Have to agree with Justin. Additionally, pigs deserve better. Were you touching yourself when you typed that? I didn’t suggest that using force makes one a fascist. Deciding that people who disagree with you have no rights and must be prevented from exercising those rights makes one a fascist. And if you’re making a specific claim that other people support genocide, you really have to provide the evidence. Ocean State Against Hate’s rhetoric about not being fooled isn’t sufficient, because then you’re just making excuses to act like fascists. Directly opposing what? Freedom of speech? The law? No, these thugs use violence and coercion in an attempt to shut people up. Clue us in–what’s “anti-fascist” in that? Make a cogent argument–with facts. Show us how smart you are! So you’re a Nazi-lover and you’re on board with their jihadi aganda. Got it. So, not so smart. Have a nice day, troll. Your ignorance is clearly on display. Nice job! Victim blaming. If a so-called “Trumphumper” were to do the same thing to you the story would be different, wouldn’t it? “Challenged”? I was walking to my car through a crowded mall filled with shoppers enjoying their day. A masked group of thugs approached me in front of a security guard and brazenly attacked me. He’s an ignorant, angry person. Life will not be easy on him. Stupid is as stupid does…. You’re a racist cop supporting coward. How cowardly can you get. Band together wearing masks and sucker shot a guy with a bike lock. Help me out. What was the lesson of Charlottesville? Sadly, apparently none for you. Oh, well. You know what they say. “If you haven’t got anything nice to say” sit next to me. Apparently he doesn’t understand the lessons and is attempting to hide his ignorance. Additionally, what’s the point? That two wrongs make a right and that this violence is justified? Apparently, the ability to reason escapes some…. The lesson is about the assult on the First Amendment, and how when that assult is allowed, violence becomes the only answer to solve it. This is ANTIFA’s fault. The Girl who got killed was the end result of ANTIFA suppressing the Free Speech of another group whom they disagree with. Clearly ANTIFA’s fault. If this doesn’t result in a long prison term for this guy it’s a damn shame. Rate my Professor.com 5 star previously adjunct Philsophy Professor Eric Clanton got probation for his bike lock attack, and will probaly get a plum job at a Progressive college. Courts have signaled bike locks “must not really be a weapon” He also snuck in between two people to sneak in the the atack…almost can’t even see it watching the video he was so fast…so perhaps part of the “Antifa street fighting 101?” Both people hit in the head could have died from such a blow, it is indeed attempted manslaughter at the least assault with a deadly weapon with intent to do great bodily harm. Who is the racist? Clearly an unprovoked physical assult against anyone is a racist act when the one attacking is a race in political opposition to another race standing in support of their own race. That’s what happened here. Who is the racist? The racism is agaist White People from a Latino (Alexander Carrion)! Carrion assulted the Trump Supporter first by running up to him and threatening him and spitting on him. It’s all right there on video for all to see. Why would you protect such a person’s identity? That’s Terrorism! That’s what ANTIFA does. They hide their Identity so they can avoid prosecution of their violent crimes. That’s what Muslims/Islamic Extremists do. I would have flattened him too. Spitting your bodily fluid on someone else is a physical assult and highly contageous for diseases. It is a great threat to someone’s life! Deport that Latino, and take away any green card he has! This punk needs a personal visit from Bikers for Trump…for an attitude adjustment.